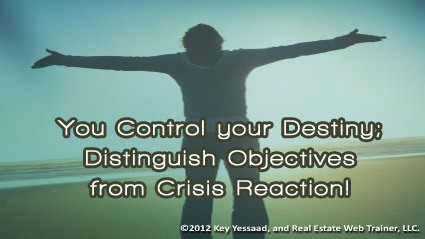 What is the difference between an Objective and a Crisis? The simple answer is: Control! You can either let the circumstances of your life control your Objectives, which will cause you to be reactive; or create your own circumstances to be creative or Objective-driven. So let us say your objective is to get a book of listing business with 25+ Real Estate Properties; that goal is then crystal clear. You either have an effective way of Prospecting that generates those results, or you learn the proper techniques to get there. The objective does not change, but your learning skills must adapt to produce the results! If you start knocking on doors or calling potential clients driven by the crisis of ‘I am financially broke I need to generate more business!’ your results will suffer – desperation creates agony and lousy results! Let’s look at an example from real life – when do you start planning for a family get-together over a Thanksgiving Dinner? – the day of?, or 2 to 3 weeks before so you can do everything you know needs to be done so family harmony is achieved? You have a choice to run your business driven by Objectives or by Crisis Management!